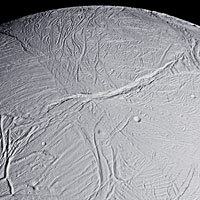 Enceladus [en-SEL-ah-dus] is the eighth of Saturn's moons and is the sixth largest. Enceladus was named after a Greek Titan who rebelled against the gods and who was later defeated in battle by Aphrodite and buried under Mount Etna. 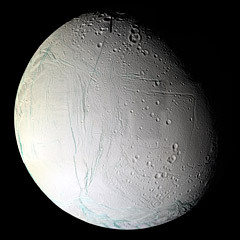 Enceladus was discovered in 1789 by the British astronomer, Sir William Herschel. Most of what we now know about Enceladus was learned when the Voyager spacecraft visited the Saturnian system. Enceladus has the highest albedo of any known object in the Solar System. It reflects almost 100% of the sunlight it receives. This high reflectivity is caused by a very smooth surface of fresh water ice. 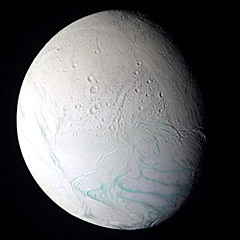 Since Enceladus reflects so much of the sunlight it receives, its surface temperature is a chilling -330° F (-201° C). 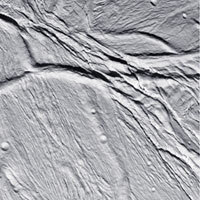 Unlike many of Saturn's other ice moons, Enceladus contains at least five types of surface features. 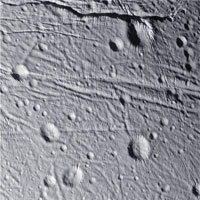 In addition to cratered areas, this moon contains smooth plains, linear cracks and ridges, fissures, and unusual crustal deformations. The craters on Enceladus are all smaller than 21 miles (35 km) in diameter. The cracks, ridges, and other unusual features seem to indicate that the interior of the moon may still be liquid. This could be caused by internal heat as a result of tidal forces from Saturn, very similar to those on Jupiter's moon Io. Enceladus is perturbed in its orbit by the gravitational fields of Saturn and its neighboring moon, Tethys and Dione. The smooth plains indicate a very young surface, perhaps only a few hundred million years old. These areas were almost certainly formed by water flowing to the surface from deep inside the moon. This could even be the result water volcanoes. 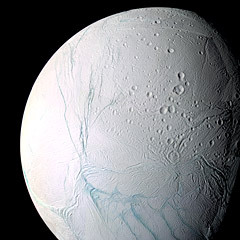 Some astronomers believe that Enceladus may still be active. It may still be in the process of resurfacing itself. Enceladus has no detectable atmosphere and no magnetic field. After the early Voyager encounters with Saturn, scientists theorized that Enceladus may be geologically active. It was also believed that water venting through the moon's surface could be responsible for some of the material in one of Saturn's rings. In 2005, images from NASA's Cassini spacecraft showed what looked like plumes of icy material rising from the surface of Enceladus. Later images showed jets of icy particles resembling geysers, or ice volcanoes, erupting from the moon's southern polar region. The material in these jets is composed mainly of water, which freezes instantly on contact with the cold temperatures of space. It is believed that Saturn's intense gravity causes Enceladus to stretch and compress. This creates friction, which generates heat and pressure, forcing liquid water out through cracks in the icy surface. Enceladus is now one of the few objects in the Solar System known to contain active volcanoes.